Today marks the end of month six of the Old School Kidlit Reading Challenge. 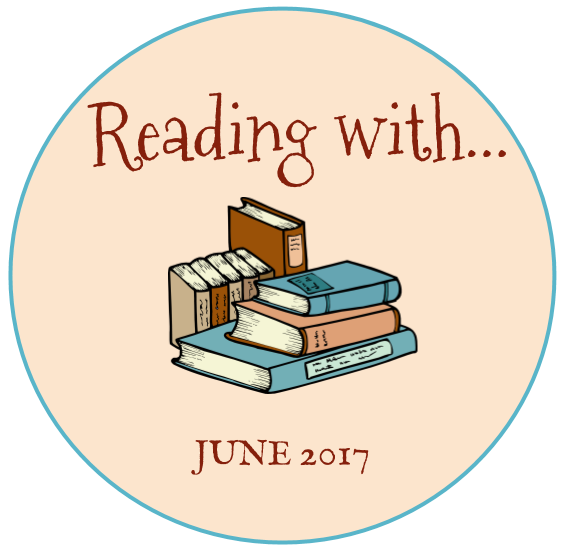 In June, we focused on Required Reading. What did you read? Share your links in comments! 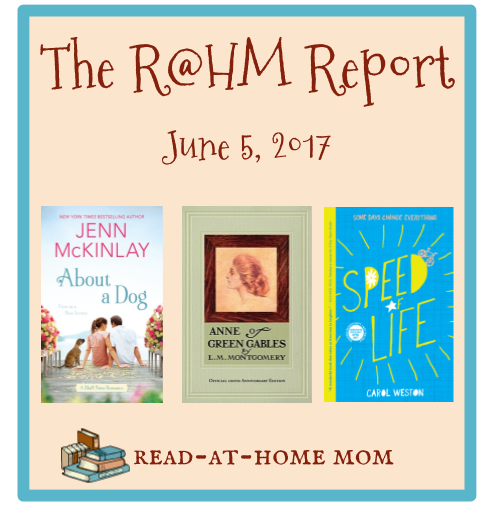 Miss Muffet has continued to blossom as a new reader this past month. She is zipping through the Hooked on Phonics readers and has also been sounding out sections of the McGuffey Primer, and even some of the books we normally read aloud to her. I plan to go through the box of easy reader books we have stashed away for her to see whether there are some she might be able to read between now and the end of the summer. She is loving all the characters in the Hooked on Phonics books, but they are pretty bland, and I think we will all enjoy seeing her read books with more interesting characters. In addition to her own independent reading, I have been reading tons of picture books aloud to Miss Muffet at bedtime. By far, the best reaction she has had to any book in recent memory is her outright laughter at Julius, the Baby of the World. 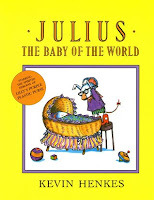 There is a section of the story where Lilly, the older sister, writes a mean story about baby Julius which reflects her jealousy over all the attention he gets from their parents. In the story, Lilly claims that if Julius were a number, he'd be zero, and if he were a fruit, he'd be a raisin. Then she writes, "Zero is nothing. A raisin tastes like dirt. The end." When I read this last part, Miss Muffet broke out into uncontrollable giggles. When I quoted those lines to her again the next day, we both laughed at our inside joke. This is the first sign she has really shown of a sense of humor. She laughs at silliness, of course, but this was the first time I really thought she understood a joke. Miss Muffet has also recently been enjoying Five Minutes' Peace and A Quiet Night In by Jill Murphy, Little Excavator by Anna Dewdney (see Miss Muffet's review here! ), The Star-Spangled Banner by Peter Spier, We the People by Peter Spier, The Twelve Dancing Princesses by Ruth Sanderson, and selections from My Bookhouse Volume 3, Through Fairy Halls. She's also taken a liking to a few new titles from our current library pile: Poppy Louise is Not Afraid of Anything by Jenna McCarthy and Molly Idle, If Not for the Cat by Jack Prelutsky and Ted Rand, and Over and Under the Pond by Kate Messner and Christopher Silas Neal. At 21 months, Bo Peep has definitely begun her descent into the terrible twos, complete with an inclination to say no to absolutely everything. One of her favorite things to say when I call her over to me for a diaper change, or to put her shoes on, or to go lie down is, "No! I readin'." And often, she does have a book in hand. 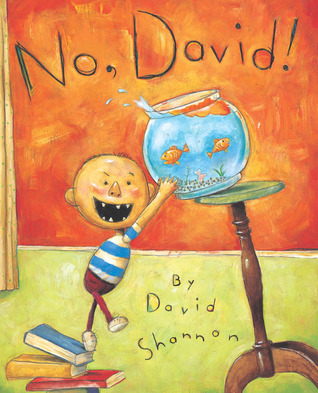 Recent favorites that she has been "readin'" are Mr. Grumpy by Roger Hargreaves, No, David by David Shannon (which she often "reads" aloud in imitation of her sister), Gossie and Gertie by Olivier Dunrea and Gideon and Otto by Olivier Dunrea. Bo Peep is also starting to learn how to shop for used books. While we were on vacation last week, she selected two books in a used bookstore, both of which we ended up purchasing: A House is a House For Me, which we previously only owned in paperback, and Nursery Rhymes by Douglas Gorsline. So far, she has refused to let anyone read them to her, but she happily paraded them around her grandmother's house "readin' to self." Because of her aversion to letting adults read to her, Bo Peep's been getting a lot of "secondhand read-alouds" lately. Since she typically won't sit for a story, we read to her sister in her presence so she can hear the stories even if she doesn't want to participate. 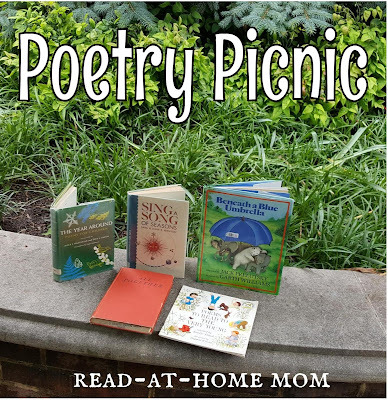 She also seems to enjoy poetry picnics, when she can nibble a cookie while listening to short poems. 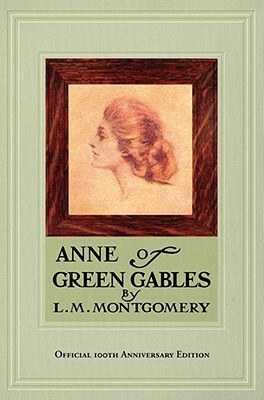 Siblings Marilla and Matthew Cuthbert are expecting to adopt an orphan boy to help around the house, so when Anne Shirley comes to them at Green Gables, they are completely surprised. Matthew takes a liking to her instantly, but it takes some convincing before Marilla decides not to send her back to the orphanage. Even then, Marilla and Anne have many ups and downs as Anne makes a life for herself in Avonlea and overcomes the hardships of her past. When I was a kid, maybe around four years old, maybe a little older, I saw a clip from an adaptation of Anne of Green Gables on television. In my memory, this is a scene where Anne walks across a fence and falls. That night, for some reason, that scene replayed in my dream, and then I had a horrible nightmare. Though the scene from Anne of Green Gables was not scary unto itself, I always associated that scene, as well as the book, with the unsettling feeling of that nightmare. This is why, until now, I had never read this book. 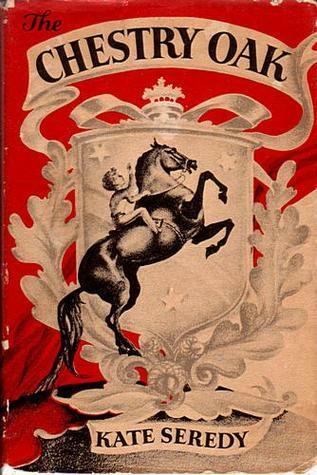 Now that I have read it, I am not certain it is a book I would have enjoyed as a kid, but it is absolutely a book I enjoyed reading as an adult. I completely understand why people like Anne. From her effusive way of expressing her feelings about anything and everything, to her wonderful imagination, to the utterly human mistakes she makes, she is a character that is easy to relate to and easy to root for. She is both fascinating and sympathetic, the kind of friend every girl wishes she had, and also very much like many girls in her desire for a "bosom friend," her rivalry with Gilbert Blythe, and her feelings of awkwardness about her own appearance. I also love the way L.M. Montgomery writes. Her descriptions paint vivid pictures of Avonlea and its inhabitants. I love the little foibles of people like Matthew, who has trouble interacting with women, and Mrs. Rachel who has an opinion about everything and uses the phrase "that's what" to punctuate her sentences. These people feel very real, and because the point of view shifts from character to character, they also provide important insight into Anne as a character. It is interesting to realize how much a child reader might miss on a first reading that would become apparent upon a re-reading later in life. I also love how many wonderfully memorable and quotable lines there are in this book. Many of these I have seen out of context over the years, and they are even more meaningful now that I know how they connect to the story. I couldn't even pick a favorite; if I was the kind of reader who wrote in her books, I'd have highlighted something on nearly every page. It is just a coincidence that I am reading this book around the same time as the release of Anne with an E on Netflix, but I completely understand why so many fans of Anne, particularly in the Catholic circles where I've been following the reviews and discussions, are so horrified by this new dark take on the story. Of course, there is a dark side to Anne Shirley's past, but one of the reasons the book is so beloved and so wonderful, is that it doesn't dwell on the darkness. This is an uplifting story where a lovable underdog turns out okay, and there is no reason for it to be made into anything else. Not every dark corner of every sad story needs to be explored; with so many "edgy" books out there now, it is comforting to know that at least one gentle, funny, and ultimately happy story is still there to fall back into. I understand wanting that story to be preserved and protected from contemporary notions of entertainment. Though I was not a kid who would have read this book willingly, I suspect my own girls may be different, and I look forward to seeing their reactions to Anne when they are older. I'm also really eager to get into the sequels, and to read more from Chronicles of Avonlea, which I will be doing as part of the Deal Me in Challenge. I'm glad to finally have moved past the Anne of my childhood nightmare, and to know this character and enjoy her the way everyone else does. When Rebecca Rowena Randall is sent to live with her spinster aunts in place of the older sister who cannot be spared at home, the beginning of her stay is anything but auspicious. The aunts believe Rebecca to be prone to foolishness, like her deceased ne'er-do-well father, and Rebecca, though spirited, knows very little of the household chores she is meant to perform. As the years progress, however, Rebecca proves to be a committed student, a selfless friend, the object of a specific benefactor's affections, and a gifted writer. This coming of age story is one I absolutely refused to read during childhood, and even now I don't think I would have liked it as a kid. I was troubled by children who had lost a parent or who simply didn't live with their parents, and all the delightful parts of Rebecca's personality would easily have been lost to me, masked by my own perception that children like her are to be pitied. As an adult, though, I can recognize the charm of Rebecca as a character. Though her adventures are confined to her home and schoolhouse, and her triumphs involve small victories like selling enough soap to help a poor family and winning a writing contest, she has an indomitable spirit and she does and says things that real kids generally only imagine themselves doing. My chief complaint about this book is how quickly events unfold in the second half. 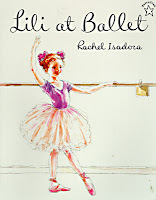 The story is at its best when it relates events about Rebecca's daily life prior to adolescence. Once she enters high school, the story moves along very quickly, and begins to feel rushed as compared with earlier sections. I also found the ending somewhat predictable, but that didn't bother me as much, since it does wrap things up very well, and on the necessary hopeful note. 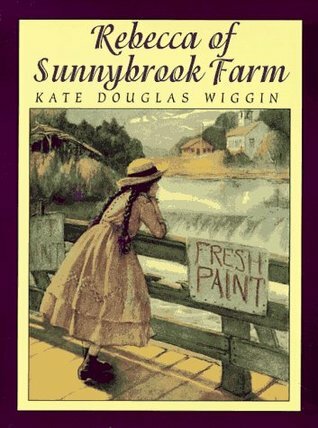 Rebecca of Sunnybrook Farm is not my favorite book (and it really pales in comparison to Anne of Green Gables, which I read immediately following it and will review soon), but I understand why it has appealed to so many girls. I will happily let my own kids read it when they are around age 10 or so, and I will probably read it again when they do. In April and May, I fell way behind in the Deal Me in Challenge, but as of this week, I am all caught up. Here are the short stories whose cards I drew for the past six weeks, with reviews. This was my first experience reading Chesterton. Though a friend of mine did tell me that his stories are funny, I was still pleasantly surprised by how much this Father Brown story (the very first one starring this character) made me laugh. The writing is pretty dense and descriptive, but there were so many lines that I wanted to copy down and remember again later. Here is just one example: "The most incredible thing about miracles is that they happen. A few clouds in heaven do come together into the staring shape of one human eye. A tree does stand up in the landscape of a doubtful journey in the exact and elaborate shape of a note of interrogation. I have seen both these things myself within the last few days. Nelson does die in the instant of victory; and a man named Williams does quite accidentally murder a man named Williamson; it sounds like a sort of infanticide. In short, there is in life an element of elfin coincidence which people reckoning on the prosaic may perpetually miss. As it has been well expressed in the paradox of Poe, wisdom should reckon on the unforeseen." I also so appreciated the story's overall focus on the value of reason when it comes to understanding God, life, and the world. Compared with the others I read this week, this story felt kind of pointless. I have read some Elizabeth Bishop poetry, but never her prose, and I did enjoy seeing how she handled this format. Still, the plot was simple - two young women visit a fortune teller, who is black, but has adopted a white child. The child seems to the women to be a prisoner in some way, and they leave haunted by the image of him. I think this is one of those stories that is meant to raise questions rather than provide answers, but I just didn't feel like I quite understood where Bishop was going with it. As she did in her novel, The Member of the Wedding, Carson McCullers creates for this story another misunderstood, outsider adolescent. Frances is a prodigy musician who has recently begun to discover the previously unimagined limitations of her genius. As she waits for another student to finish his lesson with her instructor, she reflects on the embarrassment of receiving a negative review for her recital performance and the implications of this on her future as a musician. I really liked the way this was written, and I felt that teens could relate to it as well as adults. It was interesting that I drew the card for this story immediately after the one for "Wunderkind" because they are thematically connected. Whereas Frances in "Wunderkind" is struggling with her loss of interest in playing music, Felix in "Each in His Own Tongue" has been forbidden by his beloved father to play his violin because he is meant to become a minister, not a musician. As the story reveals, however, God gives gifts to different people for different reasons, and Felix may be meant to serve God through his music. I especially loved this quote from the story, which is spoken by Abel, the elderly man who takes great joy in Felix's playing: There's different kinds of ministers, and each must talk to men in his own tongue if he's going to do 'em any real good," said old Abel meditatively. This is another odd O'Connor story that left me feeling vaguely uncomfortable. Its central focus seems to be on the human body as a temple, which makes sense to me as a Catholic, but it's also one of the most "freaky" and stereotypically Southern story of hers that I have read. I did like the way O'Connor portrays the shallow preoccupations of teenage school girls, but I walked away from the story feeling like I'd have to read it 10 more times to really grasp exactly where she was going with it. Fitzgerald's "Winter Dreams" is one of my all-time favorite short stories, and this is written similarly. When Bernice comes to stay with her cousin, she is at first unaware of how out of place she is among her peer group. When she finds out, she begins to become popular with the local young men, a fact which is helped by her repeated vague promises to cut and style her hair in a bob. Though this story is set in the 1920s, so much of its commentary on peer pressure, vanity, and fashion rings very true in today's world, especially for teens and young adults. This story also has a great quotable line which I've heard before, but I never knew the original source: At eighteen our convictions are hills from which we look; at forty-five they are caves in which we hide. 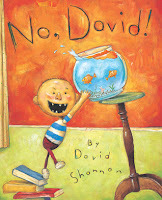 Here are some new picture reviews for the Picture Book Reading Challenge. 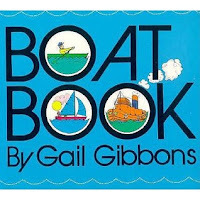 These are my picks for #2 a counting book (Edible Numbers), #12 a book celebrating dance (Lili at Ballet), #20 Mother Goose related (Lola Plants a Garden), #22 a book by Gail Gibbons (Boat Book), #55 a book by Eric Carle (The Tiny Seed), #96 a book celebrating faith (Dance in the Desert), #91 a book about history or historical event (The Star-Spangled Banner). This clean-looking, fresh-feeling picture book reminds me a little bit of 1 Big Salad by Juana Medina, but with better execution. 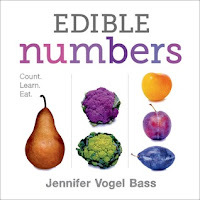 Each two-page spread shows a photo of a single fruit or vegetable on the left-hand side, labeled clearly with the number 1, and on the right-hand side a number of varieties of the same fruit or vegetable, labeled to show how many there are. Miss Muffet (age 3.5) loved seeing the many different types of familiar veggies like cucumbers and peppers, and because the numbers from 1 to 12 are interrupted on every spread by a return to the number 1, she also counts the number of objects on each page instead of just breezing through the numbers from memory. It's hard to find counting books that don't feel tedious, and this one, even after multiple readings, continues to appeal to me. 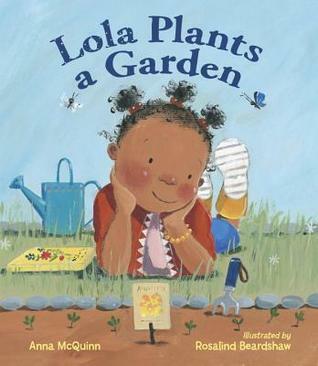 Inspired by her love of the "Mary, Mary Quite Contrary" nursery rhyme, book lover Lola decides to plan a garden. 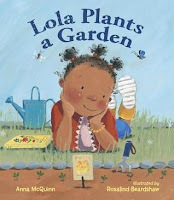 She borrows books about seeds from the library, enlists the help of her parents with the planting, and then, once everything has grown, invites her friends over to enjoy the garden along with her. I was familiar with the Lola books from reading them in story time, but they hadn't really made an impression on my own kids until Miss Muffet heard me read this at story time a few weeks ago. She wanted to hear it several more times at home, and she compared Lola's experience planting her garden to ours growing a bean in a plastic bag. 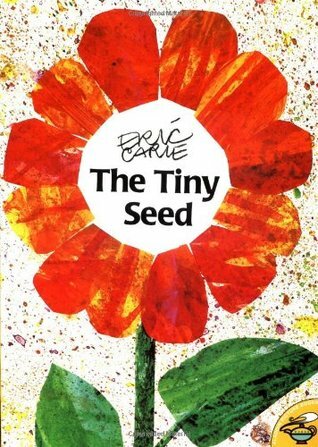 I read this book at story time along with Lola Plants a Garden. It's not my favorite Carle book. While it provides good information about the path a seed takes before it lands in a place where it can germinate, it also personifies the seed in a way that feels forcedto me. I like the artwork, but the text is really wordy, and the number of words per page varies quite a bit. Without Carle's signature artwork, I think the mediocre quality of the text would become even more apparent. I borrowed this book specifically for Little Miss Muffet and it has been very well received. 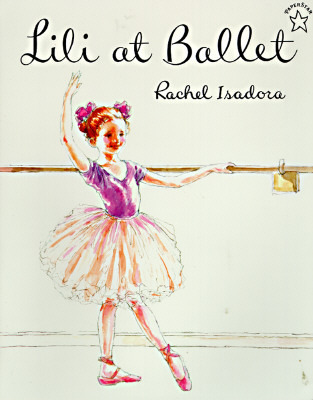 In addition to the main text which describes a little girl going to ballet class, preparing for a recital, and dreaming of her future, there is also a lot of information written amongst the illustrations, giving the names of positions, steps, types of ballet slippers, etc. We had to ask my husband about correct French pronunciation, since I took Spanish, but Miss Muffet has been enamored of this book for weeks and she wants to hear every word of the main story as well as every caption over and over again. I know there are sequels, so we'll probably trade this one in for another on our next library visit. This book shares a lot of the same problems that I have complained about in L'Engle's works in the past. The writing is beautiful (as are the illustrations), but the symbolism doesn't quite work. 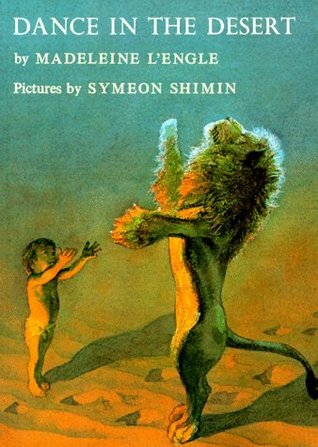 The common interpretation of this book seems to be that the child featured in the story is a young Jesus Christ and that his love and gentleness are so powerful that they tame even the wildest animal. All of this works fine, except that little Jesus is able to win over a snake. In Christianity, a snake only represents one thing: Satan. It doesn't make sense to use a symbol like a snake in a book that is so full of Christian allusions and then treat it like any other animal. L'Engle's theology always feels a little vague and touchy-feely to me, so I'm not necessarily surprised, but it is a very annoying mark on a book I otherwise really liked. This is an illustrated interpretation of the national anthem. I sang it to my girls on Memorial Day, and though the historical context is still too much for them to understand, they both liked it. My favorite part is actually the endpapers, which show flags from different points in American history as well as military flags. 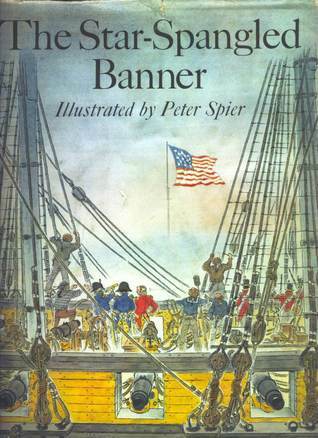 I look forward to using the book in our homeschool and to singing it to the girls again on the Fourth of July. 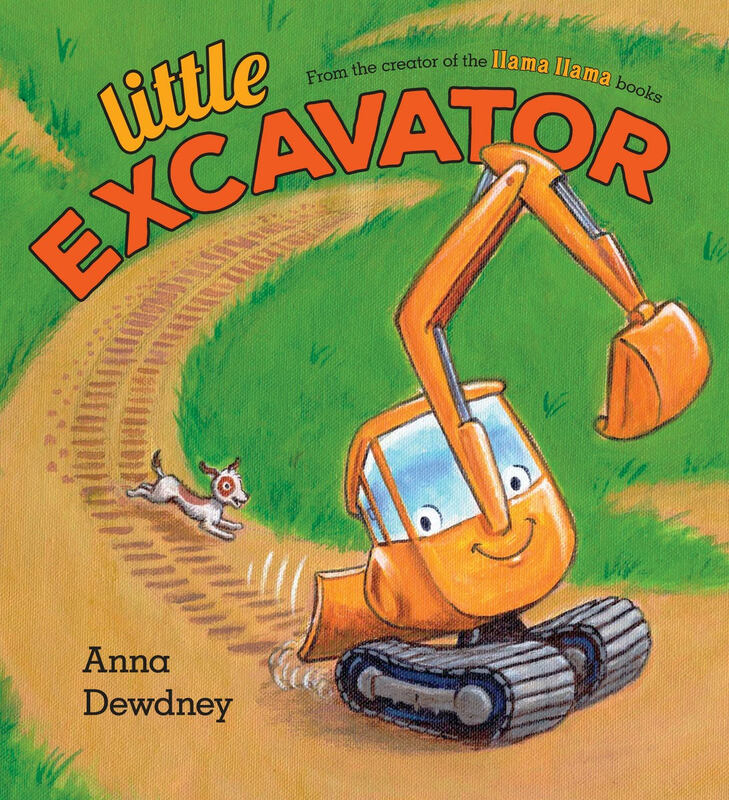 In this brand-new picture book from Llama Llama creator Anna Dewdney, there is lots of work to be done on the lot where Little Excavator and all the big rigs have just arrived. Little E is eager to help, but all the jobs are just too big for a machine as small as he is - all of them, that is, except one. I liked it because I like digging and I like work. I like it when they said, "Mighty Little Excavator, go, go, go!" I like little things and I like Little Excavator. What do you like about Little Excavator? I like that he gets tall, tall, tall. I like that he has this digging thing. I like the part where he gets in a jam. What do you like about the pictures? I like the pictures because it's about digging. And because it has little in it, and I like Little E. I like that there's big things and little things. I like orange. I like yellow. I like the orange light [on the backhoe]. The best part of it is where the car is drowning [on the beginning end papers]. Why did you like that part? Because I like cars. I like driving. And I don't ever drown. But sometimes cars drown. Was there anything you didn't like about the book? Did you like the way the story ends? What kind of ending was it? Good because at the end it's happy. Do you think other girls and boys who are three years old would like this book? What would you like to tell other children about the book? I'd tell them what I telled you. Miss Muffet has been very enthusiastic about this book since we first read it, and I have shared her enjoyment. I love the detailed end papers. At the beginning, they show the lot in a state of disrepair and the rigs coming up the road; at the end, they depict the new park and a proud, smiling Little E. I also love the use of onomatopoeia and the smooth, carefully matched rhymes. The construction subject matter isn't new, and neither is the "little people can do big things" message, but this book is one of the better-written titles on both topics. Little Excavator is a memorable and lovable character who makes a strong impression. When we went to our city's Public Works Equipment Show a couple of weeks ago, Miss Muffet had the chance to sit in an excavator, and without hesitation, she excitedly called out, "It's Little E, Mama!" It was nice to see her connecting the book to a real-life experience, and to see her joy at seeing a hint of a new favorite character in her everyday life. 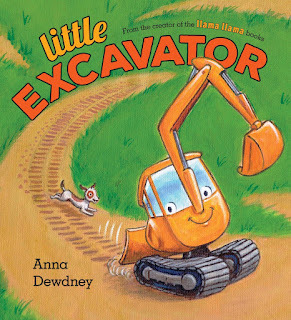 Enter for a chance to win one (1) of five (5) copies of Little Excavator by Anna Dewdney (ARV: $19.99 each). NO PURCHASE NECESSARY. Enter between 12:00 AM Eastern Time on May 22, 2017 and 12:00 AM on June 19, 2017. Open to residents of the fifty United States and the District of Columbia who are 13 and older. Winners will be selected at random on or about June 30, 2017. Odds of winning depend on number of eligible entries received. Void where prohibited or restricted by law. 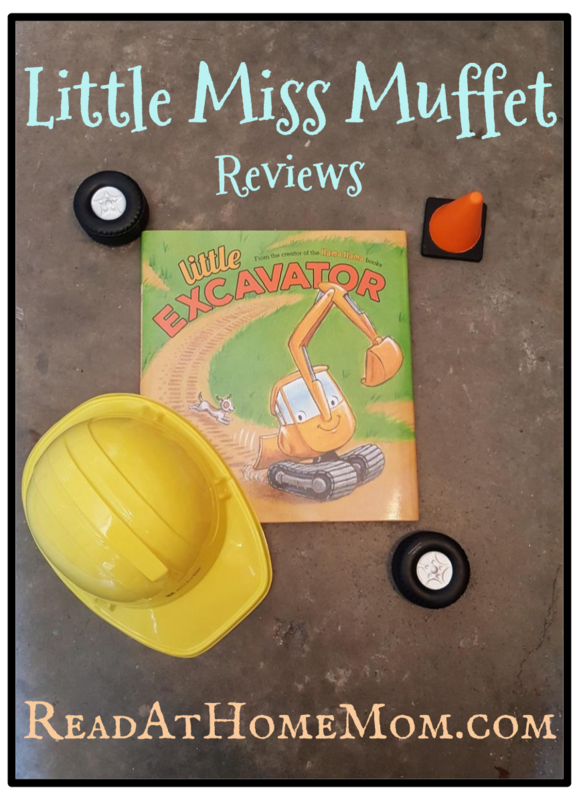 Little Excavator is in bookstores now. Thanks to Penguin Random House for the review copy. This collection is perfect for preschoolers. 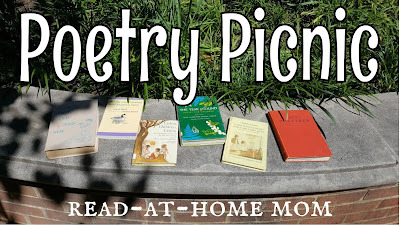 I want to work on getting Miss Muffet (age 3.5) to memorize and recite some of these poems herself. "Goodness Me," which is about a child realizing she might be starting to be good all the time, would be a good one to start with since it connects with her own struggle to behave well! I wasn't sure Miss Muffet would understand the humor of "The Worm," but she did seem to laugh appropriately. Both of these poems were taken from the summer section of the book. 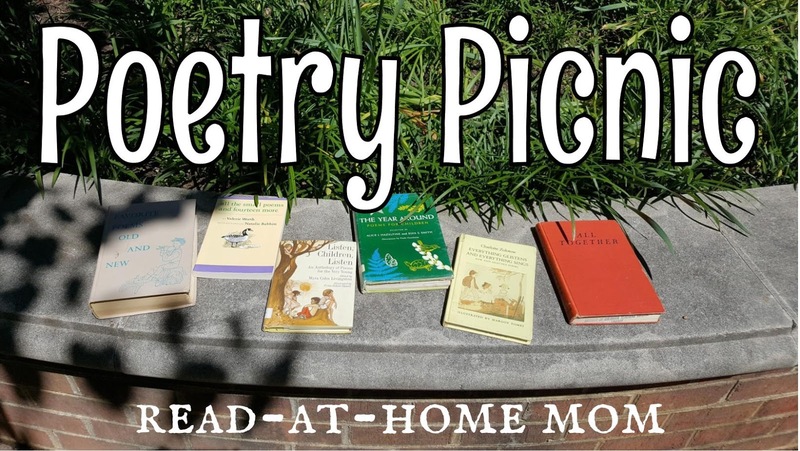 These poems were taken from the Memorial Day and Summer sections of the book. 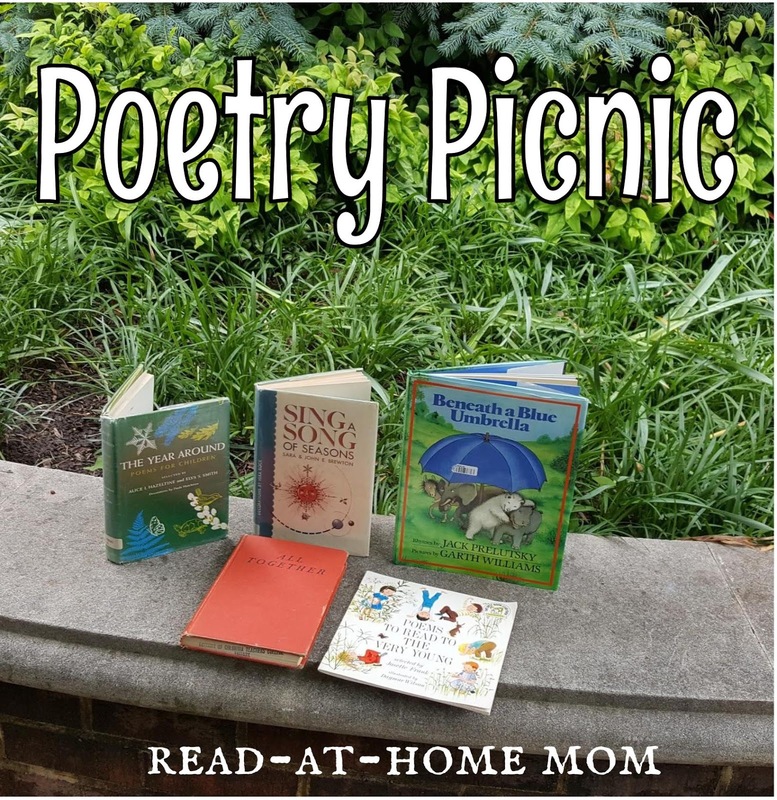 I suspect this will be my go-to source for upcoming poetry picnics, since there is something for almost every holiday and occasion. I found this book at a used bookstore and snatched it up because I love the illustrations. We have all of these poems in other anthologies, but the pictures really appeal to Bo Peep (20 mos.) and I chose these poems with her in mind. We received a copy of this book free at a recent city truck touch event. The poems are Prelutsky originals but they read like nursery rhymes, and the illustrations are by Garth Williams. The individual poems do not have titles, so I have just listed them here by first line. I have a deadline for a chapter of my own book coming up, so I haven't done that much reading over the past couple of weeks, but I have a few books to report about, as well as some short stories. Adult books always end up taking a backseat to kids' books, so I'm still plugging away at both The Cat Who Blew the Whistle and A Novena for Murder. I did, however, finish my NetGalley ARC of About a Dog by Jenn McKinlay, which I will review on Goodreads in the next couple of days. Now that I've gotten back into contemporary romance a little bit, I'd like to go back and finish the Shaughnessy Brothers series by Samantha Chase, but I will try to finish the two mysteries first. 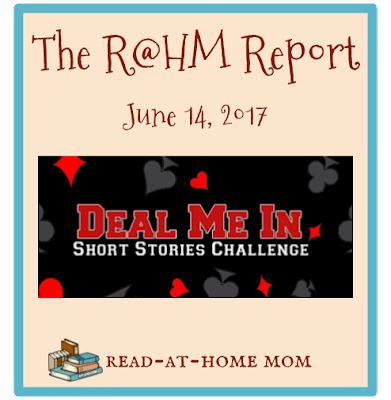 I was seven weeks behind for this challenge until last night when I read two stories: "I'll be Waiting" by Raymond Chandler (♦2) and "The Parker Shotgun" from Kinsey & Me by Sue Grafton (♦10). The Chandler was strange, and I had trouble concentrating on what was happening. The writing style was something different, and I didn't dislike it, but I also found myself thinking "so what?" at the end of the story. The Grafton story was better, probably because Kinsey Millhone is one of my all-time favorite characters. I also hear audiobook narrator Judy Kaye's voice in my head whenever I read Sue Grafton now, so that makes Kinsey feel more real. The mystery itself was solid, but not earth-shattering. I mostly just like reading about this character. I have 5 more stories to read this week if I want to catch up. Fingers crossed! I finished Speed of Life by Carol Weston, and I plan to write a review at some point, probably on Goodreads. I've also gotten a good start on my reading for this month's Old School Kidlit Reading Challenge theme of "required reading" with Rebecca of Sunnybrook Farm and Anne of Green Gables. I enjoyed both (though I liked Anne better than Rebecca) and I will have reviews coming up hopefully next week. 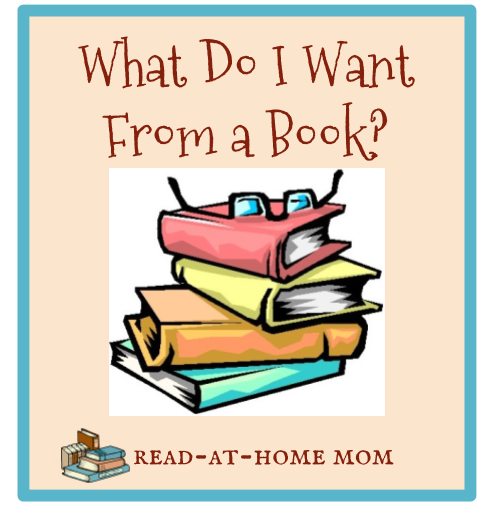 My next priorities in terms of children's novels are Almost Paradise by Corabel Shofner, The Secret Garden (which I have never read! ), Go Jump in the Pool! 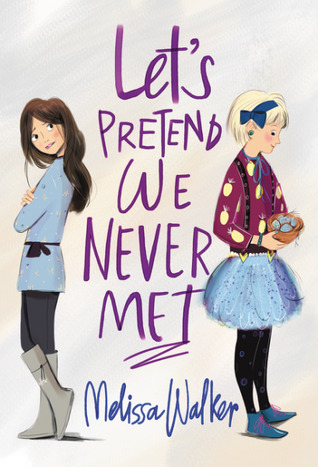 by Gordon Korman (my turn came up on the wait list at OpenLibrary) and Let's Pretend We Never Met by Melissa Walker, my NetGalley copy of which expires in just over a week. I also have a library hold on the new Sarah Dessen book, Once and For All, and as far as I can tell, I'm 9th on the list and there are more than 20 copies. If the library gets its copies on time, I hope to have that in hand by the end of the week too. Since it's Monday, I'll be linking up today with It's Monday! What Are You Reading at both The Book Date and Teach Mentor Texts. Armchair Book Expo's second topic for today is about collaborating and connecting with the online book community. 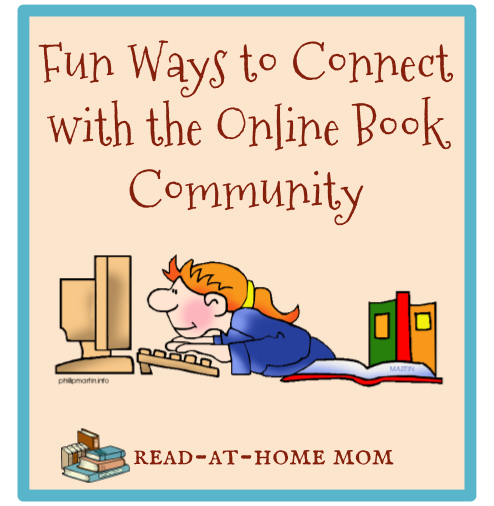 As I have drifted away from the library world, I have really enjoyed finding new and different ways to connect with like-minded book lovers. Here are three of the fun ways I have discovered new connections. Every Monday, the members of this Facebook group post the first line of whatever they are currently reading. 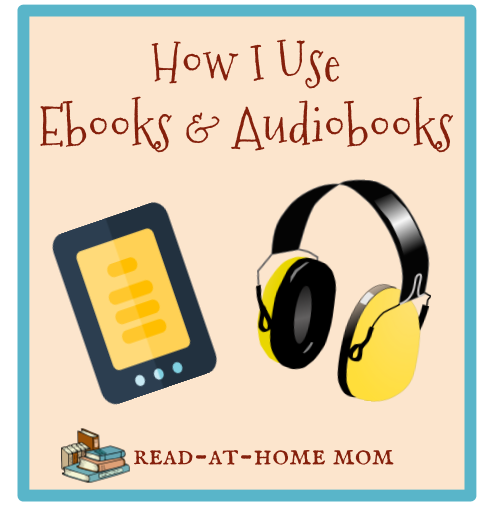 Many different genres and types of books are represented, and it's a great way to learn about new titles that would otherwise not be on my radar. Because it has such a specific focus, and we only post once a week, the group is very relaxed and friendly, and completely free of spam and unpleasant arguments. Even if I don't have a line to share, I always pop in to see what everyone else is reading. Every Tuesday night on Instagram, a group of book loving moms, led by @buildingliteracywithbooks, post a series of questions related to reading. Participants hop from one account to the next answering questions until they complete the loop. I've only answered the questions twice now, but everyone has been so welcoming, and it's been a fun way to see how other moms use books with their kids. This is a read-a-thon that happens three times a year. I've participated 5 times, and even though I'm often one of the only children's book bloggers, it's a great motivator for getting reading done. There are usually two chats during the week, which is a great way to meet people, and the atmosphere of the read-a-thon is very relaxed and fun. Sometimes I read a lot, and sometimes only a little, but I always enjoy it. Today, Armchair Book Expo is asking "What Do Readers Want?" After giving it some thought, I've made a list of the ten things that the books I enjoy all tend to have in common. Dialogue is a big part of character development. Awkward or false-sounding dialogue really grates on my nerves and brings me right out of the story, so it's important for characters to sound real and for their dialogue to flow smoothly. I don't mind an author using local color to help a character come across more realistically, but I prefer that thick accents and regional slang don't become so overpowering as to obscure what the characters are saying. Characters' speech should also align with who they are as people. Well-written dialogue makes it clear who is speaking, not just through dialogue tags, but through the style of each character's speech. Samuel Johnson identified an engaging author as one in whose work "New things are made familiar, and familiar things are made new." When I think about the kinds of descriptions I most enjoy in books, this is what I mean. I love it when an author shows me something I have seen many times from a new angle, and I like it just as well when an author can introduce a new concept to me in a way that makes me quickly understand it. There is such a thing as too much description (don't get me started on The Yearling), but authors who describe things well, especially using metaphors that arise from the world of the story itself, tend to become my favorites. Directly connected to a talent for description is an overall fresh approach to using language. I like it when an author uses certain turns of phrase that represent his or her overall writing style, and which can be easily identified specifically with that author. I also appreciate it when authors avoid cliches, especially the really common ones, such as the dreaded "She let out a breath she didn't know she was holding." I'm the kind of reader who gets really hung up on little details, sometimes to the point that I can't keep reading if something seems out of place, until I've figured out the problem. I am especially bothered by anachronisms in historical books, and complete misrepresentations of religious and cultural customs which can easily be researched with minimal effort. When an author appears not to have done his or her research, it feels like they don't care about the book, or its readers, and that makes me less inclined to care about the book, too. Setting is not always important to me. I can sometimes happily read a book with a very generic setting if it has little bearing on the plot. But if a specific setting is named, I need it to be described well enough that I can picture it. For me to really want to spend time in a setting (especially over the course of a series), it needs to come across as a place I would want to visit. I also find that settings meant to sustain entire series become more engaging if there are hidden depths for readers to discover as the books wear on. Obviously certain genres (mystery, romance, etc.) have their own specific plot structures, and I do appreciate it when books adhere to those requirements. When it comes to novels outside of those genres, however, I prefer to read books that are at least a little unpredictable. I don't like to be confused by the events of a book, so it's good for the story to be well-organized, but I also don't want to be able to see where it's going before I even hit the halfway point. I also like it when seemingly irrelevant details mentioned early in the story end up being important to the outcome. If a book has illustrations, they should be appealing to look at, but not merely decorative. Illustrations - even just line drawings - should add something to the book. This might be context for the events of the story, additional information to support the text, diagrams to help decode difficult concepts, or beautiful illuminations of key scenes. Illustrations shouldn't just be a substitute for lazy writing, or filler, but as much an integral part of the book as the text. All books have messages of some kind, but I like it best when these are not overt and are left open to interpretation. I don't want a book to manipulate me into having the "right" attitude about a social or political issue. I'd rather the book tell its story well and leave it up to the plot and characters to steer me toward careful thought about the issues at hand. Finally, I like it when an author clearly trusts the reader and believes that the reader is smart enough to understand the story being told without lots of hand-holding, over-explanation, or commentary about the story. In general, if a book feels condescending, or tries to tell me how I should interpret it, I give up after just a couple of chapters. 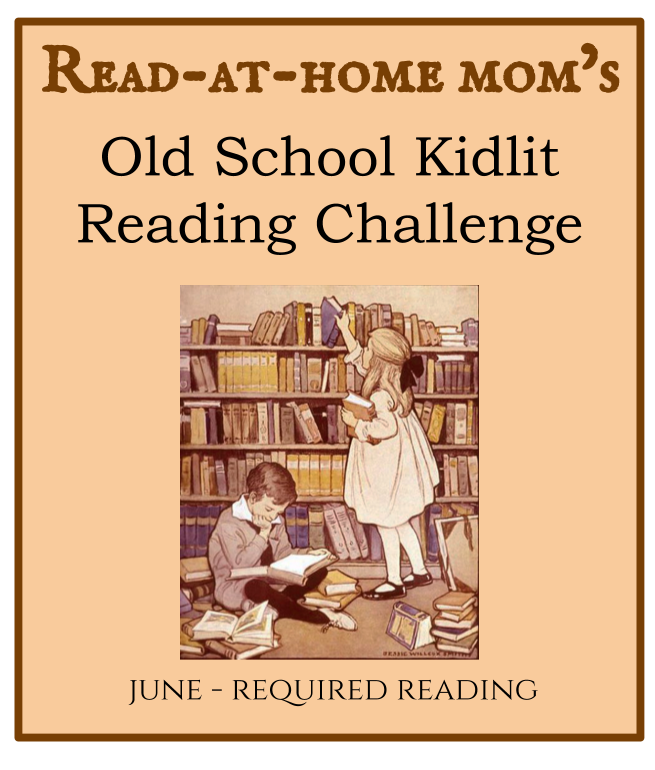 The sixth month of the Old School Kidlit Reading Challenge begins today! This month our focus is on Required Reading. This includes all of those books that "everyone has read," especially classics and those often assigned in schools. If there are classics you've missed, now's your chance to cross one or two off of your to-read list!